Almost two years have gone by since I originally set out to document our process of making soap from wood ash lye. I’m not always sure where the time goes and I often don’t have anything tangible to show for it. We burn wood as our only heating source in the living area of our house, so turning the buckets-full of ashes into something useful just makes sense. Previously I shared how we make wood ash lye water for soap making and stripping fur from animal hides and finally I have our soap making process picture documented. (that’s the hardest part, haha) Wood ash lye differs from store bought lye because it is Potassium Hydroxide. 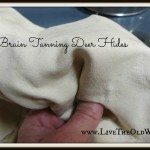 Store bought lye for soap making is almost always Sodium Hydroxide and the difference becomes apparent in the hardness of the bar it produces. That said, wood ash lye water that has been reduced enough and adulterated with a little salt can still produce a bar soap that is only mildly distinguishable from soap made with sodium hydroxide once it cures. We use tallow for our soap made with wood ash lye so that it starts off with as firm a base as possible, but there are drawbacks to that. Tallow does indeed make a harder bar of soap and ranks well on the conditioning scale, but it produces NO bubbles. 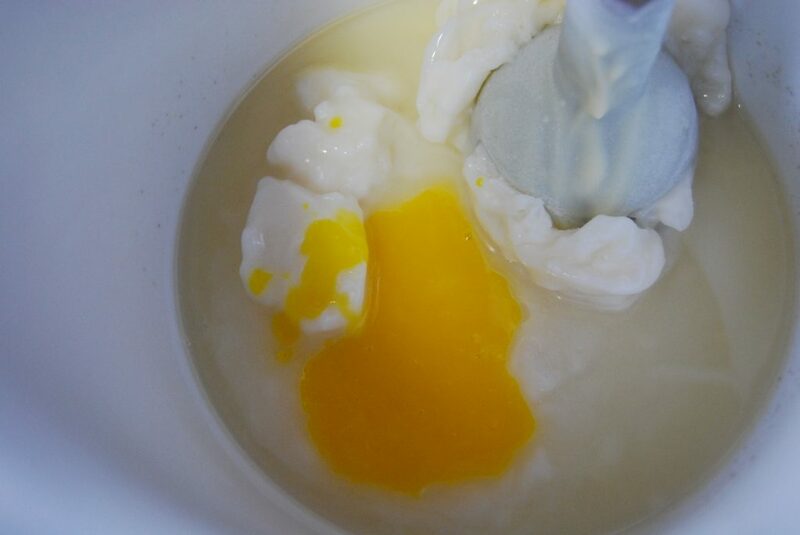 To remedy this we add egg yolks so that it has at least a little bit of lather. I wish I could tell you to read on for a fail proof recipe where you follow steps A, B & C, like for most soap recipes but there are so many variables when making it with home produced ingredients that almost every batch has to be tweaked as I’m sure it also did back in the day. To make batches of soap like they did in old days really gives you an appreciation for the standardized versions of products that are available now. I’ll do my best to give you the tools you need to fine tune your soap, but even now sometimes we just wind up using whatever the soap turns out to be. Your soap has only two “active” ingredients so obviously those are the things that will impact your final product. Which type of wood your ashes are from and how concentrated/reduced you manage to get your lye water are really the basics of coercing potassium hydroxide to make a hard soap instead of a soft soap. Hardwoods such as oak and hickory make the best ashes for lye and tallow of any kind, beef, deer, bear, etc. will give you the firmest fat base. Adding salt and egg yolk then helps make up for the qualities the two main ingredients lack. Remember to think relative to the time period these were used and not expect a bar of current day type soap. In fact, what we buy in stores today doesn’t really resemble traditional soap at all. Most of it is made with petroleum based by-products and is technically a detergent… ie: chemically created. The same is loosely true with commercially produced lye. If you don’t really care if your soap is in bar form or “jar” form, you can skip the salt and have a wonderful soft soap that you can keep in a lidded pottery jar to be dipped out with your fingers. As one of my “side hustles”, I make soap with sodium hydroxide, a variety of oils and milk from our dairy goats. 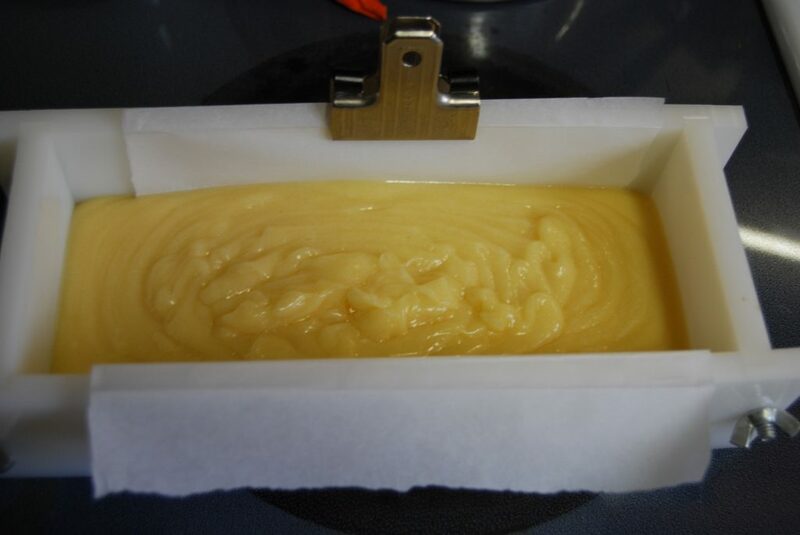 I sell that “civilized” soap at the hardware store and at our local farmer’s market, so part of figuring out this recipe comes from that in depth understanding of how soap making works. When working with modern soap ingredients, measuring in grams as opposed to ounces is much more precise and once you have a small digital scale, I think it’s actually easier. There’s a lot of difference between ounce number one and how much it takes to tip the scale to the ounce number two. (I can’t believe I’m using the term precise in relation to wood ash lye soap…) But, precision is NOT as important when working with the ingredients we’ll be using for this soap. After all, no one had a gram oriented scale back in the day. Anyway, I still use a scale and have formatted the recipe in grams. I use an inexpensive scale like this one: Digital Scale. but any one will do, even one you can pick up at the post office for weighing packages. You can make the soap in either a crock pot or on the stove or outside over an open fire if you’re really dedicated to doing it the old way. The stove will give you a bigger range of heat adjustment than with the crock pot and will be quicker, but stove top cooking will make the soap darker. Blah, blah, blah, lets get on with this. 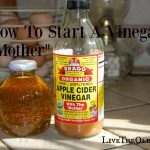 You will need wood ash lye and tallow. Separate the egg yolk from the white and add the yolk to your measured tallow. Blend these two together while slowly melting the tallow over your chosen heat source. If you’re on the stove top, start low, somewhere around medium heat. High if you’re using a crockpot. A stick blender works well if you need to break up frozen tallow, but a spoon is all you need if you’re starting with it room temperature. Next, slowly add the lye water, stirring constantly. Once the tallow, egg and lye are incorporated, add the salt. Stir continuously if you’re on the stove top and occasionally if you’re using the crockpot. Cooking will help the fats consume the lye (the process of saponification) and will cook off some of the water still being held in the lye. Depending on the water content in your lye and the amount of heat you use, this can take 20 to 40 minutes. That’s a big time span, but there are so very many variables. You can push the time if you’re on the stove top, but using the crockpot, you’re in it for more like an hour. If you’re not opposed to using a stick blender, the friction created by blender blades will cause saponification to happen quicker. Otherwise, the heat is the only thing spurring it along. The soap in the picture below needs to be stirred, but I wanted you to be able to see part of what happens while it cooks. Now consider the firmness of the dab you put on the plate. Does it cool to be firm enough? If not, add some more salt, or even baking soda. Soda will not have as pronounced an effect as salt, but mixes better after the soap reaches the chilled pudding stage. To throw another variable at you, whether your lye water was made with “soft” or “hard” water impacts how much salt you have to add at the end also. 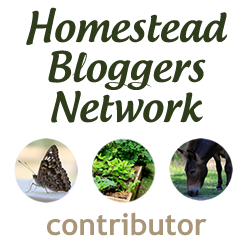 I wonder if the original homestead soap makers knew all these nuances or not. If you consider that what they might have learned living in one place may not have worked once they migrated to another place, it really gives an appreciation for what they were able to do. Once you have the cleansing and firmness like you want, turn the soap out into a shallow mold and smooth down any clumpy spots. The mold can be anything from empty cardboard butter cartons cut in half lengthwise to one of the modern soap molds that are held together with screws. If you use something that cannot be torn off, like the butter carton, be sure to line your box with parchment paper so you’ll be able to get the soap out. 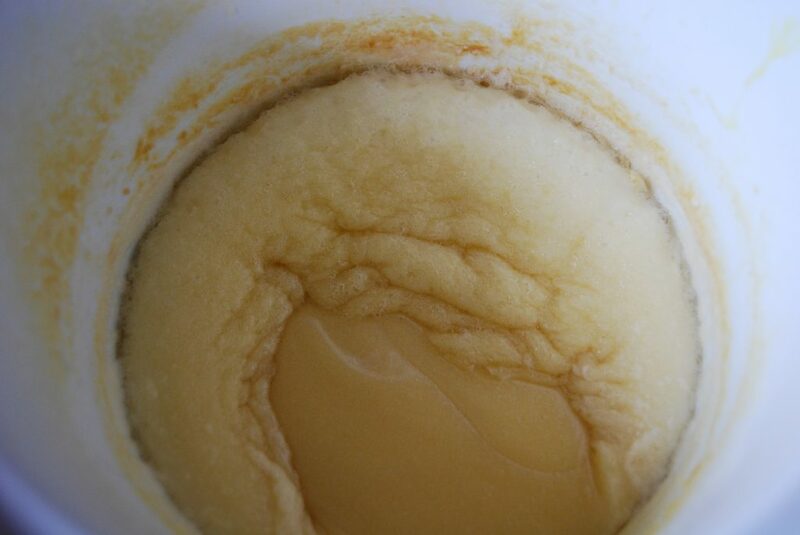 Depending on the type of tallow you used, how browned it got as it was being rendered, and whether you’ve cooked on the stove or in the crock, your soap may be lighter or darker than the picture below. This also looks vastly prettier in the picture than it really is. Let the soap cool overnight and then remove it from the mold. Even though this soap is technically ready to use because you’ve cooked it, if you let it “cure” a month or so, more of the moisture will evaporate and the bar will last longer. Equate this to how soap would’ve been made once a year at slaughter time (when they harvested the fat) and it makes sense that at least some of the soap would’ve sat around curing/hardening for up to a year. The longer it sits, the harder and better the bar. Also, the thinner you make the bar, the faster it will harden. I can attest to both of these facts. Now. Soap like this does not smell good. I’ve tried adding essential oils and even the special soap fragrance but have not been satisfied with either one. Soap fragrance doesn’t behave well and makes the bar soft again. Essential oils do okay, but it takes too much and the smell never really masks the tallow and egg. Also, if you’ve made regular soap before, be prepared that soap made with homemade lye is a much, much different process than what you’ll be used to. It goes through slightly similar stages as it saponifies, but still different. I’ve tried to cook it in a way to take it through all the stages typical to hot process soap from modern ingredients and it just doesn’t work that way. Thank you, Suzanne. I have not been doing a very good job keeping up the newsletter. I will add to you the subscription and use that as motivation to get them out more regularly! Thank you! Want to receive newsletter, etc. Thanks. Hey Dana! Awesome feedback, thank you! 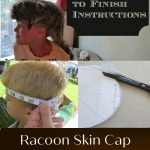 I’m sure this will be helpful to others making it. There is so much chance for variation with things like this that every bit of information helps! Hi! I’m a soap making and living history reenactor. I just wanted to add that you can add sugar, dissolve in the lye solution, as a foaming agent. Honey would work, too. Just add a teaspoon per pound of fat. I am sooo going to try this. Have you ever tried infusing your tallow? When you render it, it’s warm/hot of course. Have (as an example) dried lavender buds in the jar, and pour hot fat over it. I would leave it, then when I needed the tallow, warm slightly and strain. I haven’t done this with tallow/lard, but have infused other oils. Might be worth a try for a nice fragrance. (maybe dried mint or rosemary???) I do know you have to be very careful w/ moisture and tallow so whatever it is would need to be dried thoroughly. Sorry to throw ideas at you without having tried them. Maybe I’ll play with soap this weekend. Would love to know your thoughts on it all though. Saponification would occur but it would definitely turn out softer and potentially be just liquid soap with vegetable oil. Getting a harder bar really requires a fat that solidifies at room temperature. Idle curiosity – could saponification also be achieved using vegetable oil with ash lye instead of tallow/lard/grease/fat? Hey Rob, I’m sorry I didn’t see your question right away, we’ve had the flu and it’s been nasty stuff. I’ll try to help with the soap if I can. Were you using a stick blender to mix it or were you stirring it with a spoon? Do you recall the mixture getting to the point that it looked sort-of like mashed potatoes? In this stage it gets very frothy and is hard or near impossible to stir down . If you go past this point it will definitely re-separate. (I’ve done this before in an attempt to get it to go through the regular soap stages.) It is still usable, it just has solidified unincorporated fat around the edges but the inside should be good soap. If you didn’t reach the mashed potatoes stage, did it ever reach the point that it was in a full rolling boil? If it didn’t get to a full rolling boil, I would definitely reuse the ingredients. It’s too much work to acquire them, lol. If you do this, I’d add a little more lye in, like in half teaspoon portions and see if that would do it. My only other question before doing that though, is what did your batch you made the other day look like once it cooled? If it doesn’t have enough lye you will be able to feel the tallow and it won’t be soap like at all. In that case definitely add some more lye to it and re-cook. If it does produce bubbles though, then I would put it back in the pot and stir in a tablespoon or two of salt to draw the moisture and make it set, but don’t cook it past just re-warming it. If you’ve got pictures, definitely send them and I’ll see if I can recognize anything else. I went through probably 8 batches before I felt like I had even half a grip on it. Each batch is different because of the non-standardized nature of the wood ash lye, but every time you do it, the way it behaves begins to make a little more sense as far as determining what it needs more or less of. I love that you’re doing it on the wood stove!! I can’t get my soap to saponify. 1 cup tallow, 1/4 and 2 tsp lye. Also have 2 tbls coconut oil in it. Seems to always separate and not incorporate. any suggestions? Lye is concentrated enough that the egg floats with quarter size showing above surface.